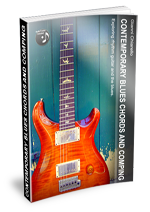 An in-depth, 66-page journey through many of the techniques used by contemporary blues artists like Robben Ford, Scott Henderson and many more. Includes over 40 Mp3 audio examples. 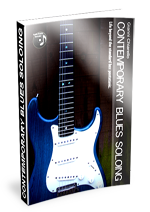 From the Introduction: ‘I have written this book with the intent of helping the intermediate blues/rock player to break out of the well known ‘box standard pentatonic shape’ and venture towards more contemporary sounds. The blues language has developed in the last few decades from just being pentatonic based, to a more articulate language, thanks to fusion and jazz influences. I have been asked too many times during my years of teaching how to go beyond the usual pentatonic phrases that we have all heard way too many times, so I thought of collecting a wide array of ideas to steer your playing in different directions, not only harmonically, but also rhythmically’. The ebook is a digital download in the popular Pdf format and includes a recording of all audio examples in MP3 format. Click here to download the Contents table and a sample of the book with Mp3 recording free!